OCAD Book Arts Show Triumphant! There’s an old joke that floats around the letterpress and book arts scene: “You never sell books at a book arts show!” It’s not really a reflection of book arts shows, but rather the challenge of selling hand printed books in general. And this year I saw lots of books selling at the OCAD Book Arts Show, and even waved goodbye to a couple of my own. One of the things I love about the OCAD show is the very obvious presence of students exhibiting their work. It brings a raw freshness to the book arts, and I am always astonished at how many young artists are being attracted by old school books and printing. The venue is quite striking as well, as I tried to caption in my first experiment with panoramic photographic stitching, early in the show. Crowds filled the hall for most of the day. (Click photos to make them larger). 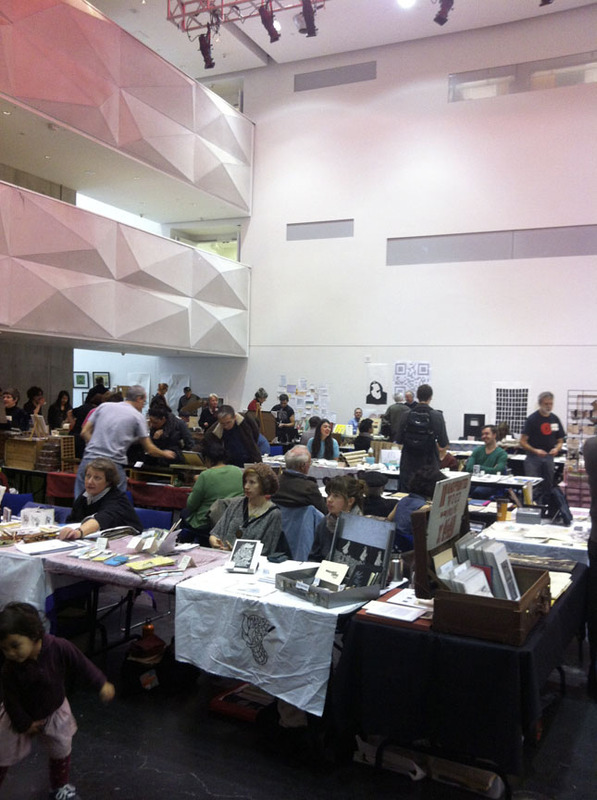 The Great Hall at OCAD in Toronto, with the Book Fair in full swing. This entry was posted on December 4, 2011 at 1:07 pm and is filed under Bookbinding, Books, Letterpress printing, Paper, Shows. You can subscribe via RSS 2.0 feed to this post's comments.